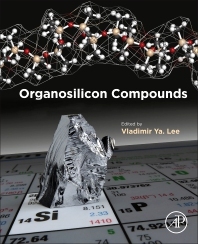 Organosilicon Compounds provides readers with the state-of-the-art status of organosilicon chemistry, including its theoretical, synthetic, physico-chemical and applied aspects. By including high quality content in a key strategic signing area, this work is a strong addition to chemistry offerings in organic, main group and organometallic research. Organosilicon chemistry deals with compounds containing carbon–silicon bonds, an essential part of organic and organometallic chemistry. This book presents the many milestone in the field that have been discovered during the last few years, also detailing its usage in commercial products, such as sealants, adhesives and coatings. Dr. Lee has more than 30 years in experimental organometallic chemistry, specializing in the field of Main Group elements chemistry, primarily the heavier Group 14 elements (Si, Ge, Sn, Pb). In addition to his background and career as a synthetic organometallic chemist, he has extensive experience of the scientific writing and publishing processes as the author and co-author of more than 100 peer-reviewed research papers, published predominantly in high-ranking international journals (JACS, Angew. Chem., Organometallics, Inorg. Chem., etc.). He has also written scientific books contributions and co-authored six book chapters and one monograph, the latest of which are the following: (a) V. Ya. Lee and A. Sekiguchi. Organometallic Compounds of Low-Coordinate Si, Ge, Sn and Pb: From Phantom Species to Stable Compounds, Wiley, Chichester, 2010 [monograph]; (b) V. Ya. Lee and A. Sekiguchi. Multiply Bonded Compounds of the Heavy Group 14 Elements. In Comprehensive Inorganic Chemistry II (Eds. J. Reedijk and K. Poeppelmeier), Elsevier, Oxford, 2013, Vol. 1 (Vol. Ed. : T Chivers), Chapter 1.11.